During the Art Bytes hackathon that took place at Walter Art Museum in Baltimore last weekend, 3d scanning/modeling company Direct Dimensions was doing 3D scanning of different objects inside the museum. 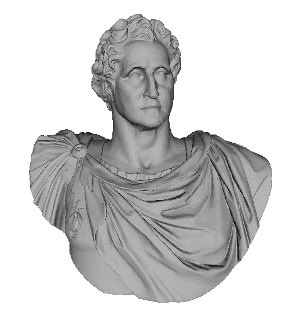 One of the objects chosen for 3D scanning was a bust of George Washington. This event gathered about 14 teams and one of them was united under the project called “George Crowdsourcington”. The group used the data provided by Direct dimensions and split it into 110 independent digital pieces. Each piece was digitally marked. It was done on the one side to control printing activity, on the other side to simplify and speed up the replica assembling. “George Crowdsourcington” group hope to finish 3D printing of the bust by the end of this week. They ran a special company through the site “We the builders” where people can request one of the pieces and print it out using their own home 3D printers. The group expects those printed pieces to be sent back to them and they would be able to assemble a 3D replica of the original George Washington bust. If you want to know more information about the project or to be a part of it and print out one piece of George Washington bust, just visit We the builders home page.